Even the most durable equipment on the market can be damaged whether its kites or boards. We have a lot of spares stocked in our shop for most brands but often a professional repair is needed. We pride ourselves in making the kite repairs very precise and accurate so that there is no affect to the kites flying characteristics and are hardly noticeable. The type and colour of the material is matched to original. Please see our previous examples below. If we feel the damage may be a default and require a warranty claim we can provide details for this as well. This table shows approximate costs, please contact us for more accurate quotes and if emailing please include a photo of the damage. Slow Puncture £20 - £40 These are notoriously hard to quote for as can be quick and easy but equally slow and difficult. We'll do our best to keep costs down and repair rather than replace where possible. Leading edge blow out £45 - £85 Often look worse than they are. We'll try and repair the original bladder where possible. Bridle repair / replacement £8 - £12 per section approx We can produce any bridle parts to replace worn sections. A whole new bridle replacement isn't necessary. Replace / repair lines £18 + depending on the quantity We make lines to length in various breaking strains. From 350kg (standard) to 800kg. Change depower rope / safety line £30 - 40 We build and fit depower ropes. These are far less expensive than those supplied by the kite brands but are exactly the same. £10 We'll give your kite / bar a full check over (including bladders) & service, please note that the price only includes the cost of minor replacement parts. 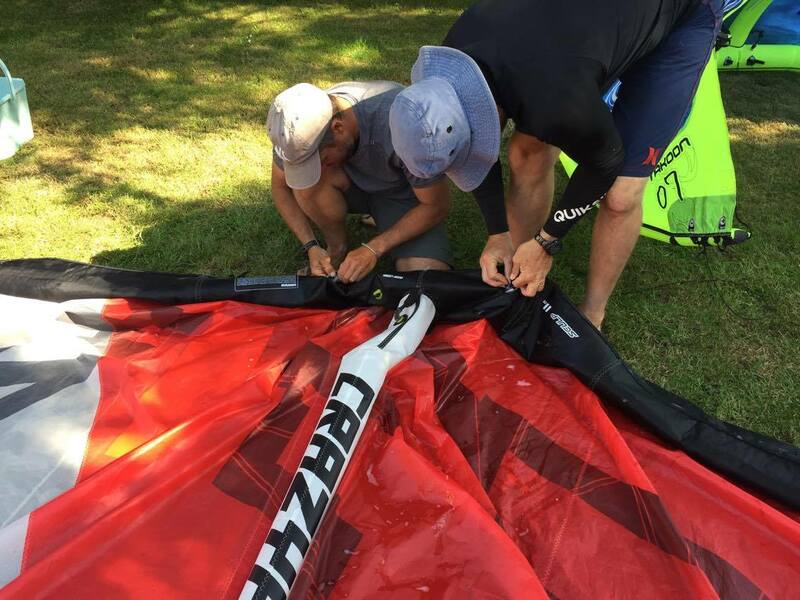 We suggest having your equipment checked at least once per year, so if your kite is in for repair (or if you'd just like it tested) it's a good opportunity for us to give it a full check over to make sure it's still safe to fly. We'll check the attachment points aren't defective, bladders are holding air, bridles aren't unsafely worn, pulleys are running smoothly, valves are all air tight and the leading edge stitching isn't beginning to fail or has any nicks from the beach surface, which is very common and leads to a big (expensive) blow out. If you drop the bar in too we can check safety lines, depower ropes & pigtails aren't unsafely worn, lines are of equal length and the bar is trimmed correctly (they all stretch unevenly with every brand) which will get it back to like when new and safe to use for another season. 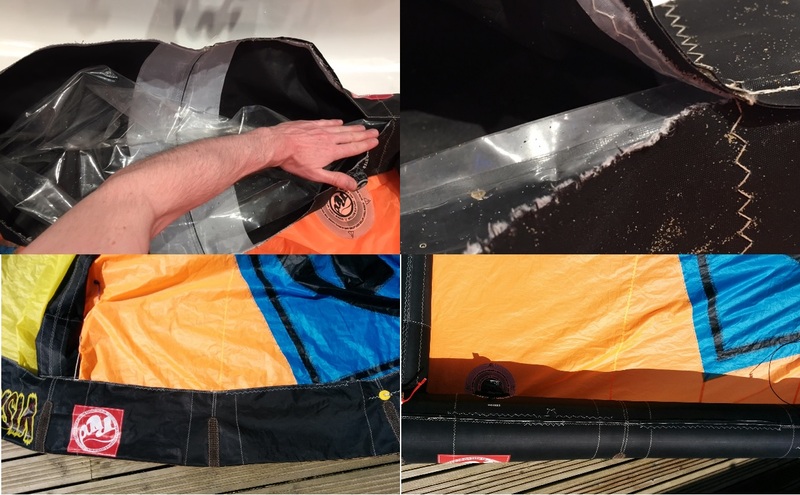 In most other extreme sports the equipment is under very strict regular testing (some even require licences to be stamped) and in kitesurfing the kit is put under massive stress and strain where failure can have fatal consequences, so why take the chance? If sending a kite or dropping in the shop, please be sure to clean and dry it before hand as we can't put sandy salty materials through expensive machines. If we have to clean and dry equipment there will be an additional surcharge. If you're sending a kite to us, you MUST complete one of our repair forms and send it with the kite, this helps with finding problems and keeps the cost down if we don't have to search all over the kite, also knowing where to return it. If you don't list all the problems on the form, there is a chance they'll be missed during the service. The unfortunate owner of this kite had someone ride straight through it whilst the kite was down during a competition - in one side and out of the other creating the two huge holes. As you can see, even with damage of this size the repair is still hardly noticeable and the kite flys perfectly, just as it did originally. Nothing is beyond repair. Unfortunately the kite was almost new! Otherwise we would have replaced the panels. Fully colour matched repair, the graphics re-done as well.